Thousands of revellers in Trafalgar Square in London and along the Embarkment saw in the new year and a new decade. All across the nation and Empire people have celebrated the coming of 1940 and many have high hopes of what the coming decade may bring. The War Office has confirmed that it has ordered 100 armoured cars from Yugoslavia to equip the Army. They will be delivered this year and will be designated the Carrier Armoured Wheeled No.1 Mk I. In late 1939 Vickers arranged a production licence for the new Yugoslavian Lazar armoured car and the War Office has an ultimate requirement for up to 600 vehicles. It uses a Ford engine and a Marmon-Herrington four-wheel drive chassis and the armoured hull is open toped. The crew consists of driver and gunner and a commander. Four infantry can also be seated inside if only two crewmen are carried. The Wheeled Carrier is a substitute for the tracked carriers in 2nd Line TA formations and certain overseas units in built up areas and for training and for mechanised AT batteries. The Mk I either has an armament of one Boys anti-tank rifle or Vickers .661in HMG in the front port and one Vickers ‘K’ on a pintle mount. Both variants can tow trailers or a light AT-gun. General J. Gort has retired from the post of Commander of the Imperial General Staff (C.I.G.S.). He has been replaced by General J. Dill. General Gort is an Irish Viscount, and a Great War hero being decorated with the VC, three DSOs and the MC. In 1935 he was appointed Chief of the Imperial General Staff and will now take up an administrative role as Inspector General. In related news Air Marshall Dowding of the RAF has also given his intent to retire this year from active duty and a new officer will take charge of Fighter Command which Dowding has built up from almost nothing to ne of the finest aerial defence systems in the world allied to the best fighters in the world. The Admiralty today confirmed that four old S Class destroyers have been sold to Iraq. They are the Al Tami (ex-Speedy), Al Adrisi (ex-Sepoy), Al Bahi (ex-Tactician) and Al Shaab (ex-Tara). They are the first destroyers operated by the tiny Navy and will be used for coastal patrols and to safeguard the tanker routes of the Persian Gulf. A secret report from the Admiralty to the CID confirms that development of the Gunnery Director Type 284 is complete and will soon be fitted to several capital ships. It has a range of at least 45,000 yards and will be fitted to both battleships and cruisers. A simple ceremony and parade marked the opening of the Naval Construction Research Establishment at Rosyth. It has been tasked with working with the Department of Naval Constructors to develop new methods of ship construction and the development of new steels and armour development. The War Office has released its plans for additional defence equipment for Egypt and Iraq in the forthcoming year. The Royal Egyptian Army will form a twelfth Infantry Battalion and an Armoured Regiment will be created with 43 Cruiser Tank Mk V Crusader (A15) and 40 Vickers Valentine tanks. Similar plans exist for the Royal Iraqi Army which will re-equip the Armoured Car Regiment with 70 Daimler Armoured Cars and an Armoured Regiment will be formed with 80 Cruiser Tank Mk V Crusader (A15) tanks. The REAF will receive twelve Hawker Henley B.Mk.II bombers to form a new squadron while the RIAF will receive Supermarine Spitfire F.Mk.III fighters during 1939 to re-equip No.3 Squadron and 12 Hawker Henley B.Mk.II bombers to re-equip No.4 squadron. The small Royal Iraqi Navy shall soon receive four ex-RN Admiralty S Class destroyers and possibly a light cruiser to augment its small coastal defence force. The Royal Aircraft Establishment has finally arranged a series of trials to prove the theory of in-flight aerial refuelling. Sir Alan Cobham’s Flight Refuelling Ltd is the prime contractor and will provide all the equipment necessary. The RAF will provide the aircraft, operating base and aircrews. Three surplus Whitelys will be used as tanker aircraft and one Whitley, one Birmingham and one Blenheim will be used as receiver aircraft. Three different types of drogue will be used during the trials to determine the best type. Each tanker aircraft will be fitted with extra tanks in the bomb bay for up to 700 gallons of fuel, a hose and drogue on an electrically powered drum unit, extra formation lights on the wingtips, underwing, tail and ventral positions, an extra ventral searchlight and the rear turret replaced by a glazed tanker-operator’s position. The Assistant Chief of Staff, Air Vice-Marshal William Sholto Douglas, announced to the Committee of Imperial Defence today that the ASV Mk II radio-location set has now begun operational trials. It is hoped these sets when fitted to aircraft will enable them to detect small ships within 22 miles. Two Yugoslavian destroyers have made an offical visit to Malta. The Pristina and Podgorica have anchored in Grand Harbour and will be guests of the Royal Navy. Today at Filton crowds of proud workers gathered as Bristol Aircraft’s Chief Test Pilot Cyril Unwin took their latest creation aloft on its first flight. The Bristol Type 163 Buckingham is the RAF’s newest bomber to replace the old Blenheim. The bomber is powered by two new 2,520hp Bristol Centaurus II radial engines. They performed well during the flight and Unwin stayed aloft for thirty-six minutes before returning to Filton. A crew of four is carried and the self-defence armament will consist of a dorsal turret with four .303in Browning MGs, four more fixed in the nose and two more on a ventral cupola. 250 are on order and entry into service should be late 1941. The RAE at Farnborough has completed their initial assessment of the Fl-282 V6 and it has now been passed to the A&AEE at Martlesham Heath for further assessment as to its military value. There are currently only two pilots qualified to fly the type (one Flettner UK test pilot and one RAF pilot) but the first two Fl-282 helicopters ordered by Flettner UK for demonstration purposes should join the RAE and the MA&AEE at Felixstowe within four months to allow naval trials and pilot training to take place. Today the port of Weihaiwei was handed back to the Chinese Government. 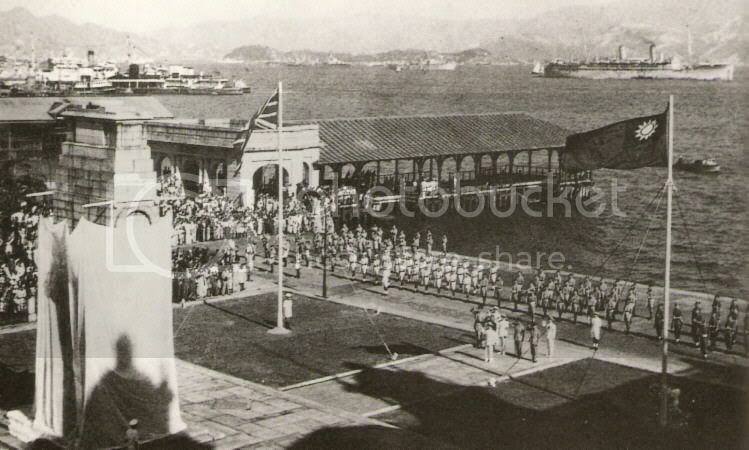 A final parade was held and a guard of honour lowered the British flag for the last time and the governor Sir Malcolm White then shook hands with the head of the Chinese delegation and both sides saluted as both national anthems were played and the Chinese flag was raised. The port of Wei Hai Wei was once the base for the Beiyang Fleet of China during the Qing Dynasty. During 1895, the Japanese captured it from the landward side. It was evacuated during 1898. After Russia leased Port Arthur (on the opposite coast) from China for 25 years during March, 1898, the United Kingdom obtained a lease for Wei Hai Wei which was to exist for as long as the Russians leased Port Arthur. During 1905, when the Japanese assumed ownership of the lease for Port Arthur, the British lease was made to exist as long as the Japanese occupied Port Arthur. Thus the city was part of a territory (c.285 sq. miles) called Weihaiwei, which was leased by the United Kingdom from 1898 until March 1 1940. It was a summer station for the British naval China Station and it was also used as a sanatorium. It became one of two major ports for ships of the Royal Navy in the Far East (the other being Hong Kong in the south). At the beginning of the lease the territory was administered by a Senior Naval Officer of the Royal Navy. During 1899, administration was transferred to a military and civil commissioner appointed by the War Office in London. The territorial garrison consisted of 200 British troops and a specially constituted Chinese Regiment with British officers. During 1901, it was decided that this base should not be fortified and administration was transferred to the Colonial Office. A Civil Commissioner was appointed during 1902 to manage the territory, and the Chinese Regiment was disbanded during 1903. The last British commissioner of Weihaiwei was Sir Malcolm White. The Central Navigation School at Shawbury has been renamed the Empire Air Navigation School. It will now begin training navigators from all over the Commonwealth and the Empire and will be one of the foremost such schools in the world. The Sterling Armament Company at Dagenham, Essex today celebrated another export contract for their Lanchester sub-machine gun. An order for 500 has been received from the Argentine Infantería de Marina. The chief of Bomber Command, Air Chief Marshal Edgar Ludlow-Hewitt, today formally opened the Bomber Command Development Unit at Boscombe Down. This new unit will operationally test all future new bombers before they are passed to frontline squadrons and will continually test and refine tactics, navigation and bomb-aiming equipment and ordinance. Aircraft noted on the apron today were three Boulton Paul P.90 Birmingham B.Mk.I heavy bombers, three Vickers Wellington B.Mk.III medium bombers, a Fairey Balmoral B.Mk.I light bomber soon they will be joined by Avro Lancasters, Bristol Manchesters, de Havilland Mosquitoes and Bristol Buckinghams. Today the Gloster SS.42 variable-incidence wing research aircraft made its first flight. The undercarriage was left un-retracted and no problems were noted. Another SS.42 is nearing completion in the Gloster workshops. The two SS.42s are for the Admiralty and will be used in a research programme into variable-incidence wings for carrier use. This two-seat aircraft has high mounted variable-incidence wings with ranges between -1 and +14 degrees and leading-edge slots and Fowler trailing-edge flaps for maximum lift. Neville Chamberlain today announced the next General Election will take place on Thursday May 20th. The Conservatives are hoping to win a majority without Liberal support this time and Labour is pressing its advantage in the larger urban areas to hopefully win an election for the first time in many years under the leadership of Clement Attlee. The Air Ministry has ordered fifty Blackburn Boston Mk II flying boats with the world-leading advanced retractable pontoon system. The Mk II Boston is powered by two 2,500hp RR Vulture IV engines for a maximum speed of 335mph; range 1,500 miles and a service ceiling 35,000ft. The Mk II will also be equipped with ASV Mk II radio-location gear. The first pre-production aircraft (converted from the B.20 prototype) should fly in the early summer. His Majesty King Edward VIII today arrived in Berlin on the first leg of a European tour. The King arrived at Tempelhof Airport after a cross-channel flight aboard an RAF King’s Flight aircraft at 14:00pm. After a brief opportunity for photographs the King waved to the crowds before heading for formal meetings with the German President Eckner, the new Chancellor Konrad Adenauer and the Cabinet. After these talks ended there was another official press gathering. It is thought that there were no serious discussions at this time. His Majesty King Edward VIII today on the second day of his German tour made a formal address to the German Reichstag in the morning. During his thirty minute speech he praised German efforts to maintain the peace in Europe and the close co-operation between "our two great nations". He then called for greater co-operation in the future "for the great prosperity and security of Western Europe in the decades to come which we can all enjoy the fruits of our labours" and called for a celebration "of working democracy in Germany, to those who doubted the Tuton could ever shake off authoritarian rule todays Reichstag is a shining example of what can be acheived when men come together to find the best solutions for the affairs of State." In the evening His Majesty attended a State Dinner with many other dignitaries including members of the British Embassy and German political and military leaders. His Majesty King Edward VIII on his tour of Germany today spent the day privately touring Berlin including several art galleries and museums. Crowds flocked to see the King and he walked among the crowds during the afternoon. His Majesty King Edward VIII today travelled to Herrenhausen by train for an extended semi-formal visit and was greeted by large crowds on his arrival at the railway station, but most press reporters were kept away from the King for this personal visit. His Majesty King Edward VIII spent most of the day at Herrenhausen in private meetings with family and various relations from across Germany. This is the first time such a family gathering has been attempted since before the Great War. At home several newspapers have special Royal Visit photographic magazines in them, with the new Picture Post having a colour section. In general the press are behind the King's visit to Germany and see it as the final healing of the wounds of the War but many veterans have decried the decision to go. Most commentators see Germany as likely to be Britain's most important ally in Europe alongside Nordmark. His Majesty King Edward VIII today, on the seventh day of his German tour, made a day trip to Kiel. It was a full day and His Majesty had a brief tour of the naval base and inspected some vessels under construction in the shipyard; the battleships Sachsen and Bayern, the light cruiser Magdeburg and the submarine U-108. In addition the nearly completed two battlecruisers for Argentina were also visible in the fitting-out dock. Later in the day he made an official visit to the ships of the Baltic Naval Station. The crews lined up on deck in fine uniform and His Majesty took the parade and inspected some of the crews and went aboard a couple of warships. First he visited the Motor Torpedo Boat H-186 aboard which he had lunch with the officers before inspecting some the U-Boot fleet at anchor during the afternoon. On his visit to the Kiel shipyards His Majesty King Edward VIII was overheard to say, “Our new battleships now under construction make the Sachsen look like an inferior ship of the line in every way.” This remark made to the Naval Attaché to Germany, soon found its way into print in the Daily Mail the day after. It began another round of serious questioning about the Admiral Class. No class of warship had ever been surrounded by such secrecy by the Admiralty before. Any curious enthusiast eagerly awaiting more information in Jane’s yearbook were disappointed to find the same data and official sketch as offered to the press two years ago. Brassey’s contained less, lacking the picture. In the hunger for copy several papers sent reporters to the pubs and betting shops of the towns where the five battleships were being built in an effort to prise some secrets from the workers themselves. The loyal dockyard workers at the Royal Chatham Yard divulged nothing, however the workers at Vickers-Armstrong at Barrow proved much more talkative and much of what they said entered the newspapers. One welder claimed the ships would have “19in guns, nine of em”, another claimed “all three turrets are mounted for’ard” and others said the giant battleships were 900 feet long, had quadruple turrets and the London Illustrated News carried an article of one such fantastic ship. One intrepid journalist decided to look for himself and charted a Dragon Rapide from Blackpool airport to fly him over the yard at Barrow. He made two passes but on returning home was escorted by two Hurricanes and found himself under arrest on landing. He was taken to the local constabulary but later released, albeit his glass plates were confiscated. Unofficial reports claimed that Vickers had begun testing large calibre guns for the navy at that one was at least 19in in calibre. At the end of April one Labour PM in the Commons raised the question about just what ships the Navy was building. The official statements seemed to show repeat Lion Class vessels but the papers were claiming something more akin to 65,000 ton battleships armed with guns of at least 18in. The First Lord of the Admiralty, The Earl Stanhope in his reply simply said that the nation was building battleships equal to foreign powers. This began a series catcalls from the Labour backbenches and the government was accused of wasting public money, lying to public and excessive police state behaviour. They wanted to know if the Navy was trying to cover up the fact it was in reality building obsolete battleships or instead wasting millions of public funds on Super-Battleships much larger than they needed to be. Finally one journal published a basic line drawing sketch of the supposed Admiral Class ships but it lacked any details at all. One Admiralty source pointed out to the press later that week that the Sachsen Class building in Germany might be good pointers but when the First Lord of the Admiralty returned to the House of Commons the following week the information he gave was hinting that the vessels were indeed repeat Lions “with several improvements in armour.” And so gradually the press moved onto other things and the public awareness of the ships faded. Gloster is in the news again as its twin-engined improved Gloster Gunner F.Mk II enters service. Powered by two 1,250hp Bristol Taurus X it has a maximum speed 372mph at 15,000ft and a service ceiling 32,500ft. It is some 20mph faster than the Mk I and has the same armament of four Oerlikon 20mm cannon in the nose. The First Lord of the Admiralty, The Earl Stanhope in his reply simply said that the nation was building battleships equal to foreign powers. "...that will not fire a round, or even raise steam, until some time in 1945." To be fair, they are even more scathing towards the monstrosities under construction in Japan. They see no point at all in a ship that can't be completed in five years or less, and even that is regarded by many as excessive. It is presumed that His Majesty made such a remark outside of German earshot, thus allowing the German Government to tactfully ignore the comment. As for the British tabloid press, they are a law unto themselves. Well the Admirals are a carefully concealed secret, at some point news about them is going to leak but for now just the thought that they may have 19in guns all forward might confound and make a few enemies shudder a bit. The King meant no disrespect to Germany, it was a private comment. Several German Admirals know the truth about the Admiral Class since Germany and Great Britain have discussed all their latest capital ships with each other in some depth. His Majesty King Edward VIII has a day of rest at Herrenhausen. His Majesty King Edward VIII today made a day trip to Wilhelmshaven for a Fleet Review. On arrival he took the salute as a thousand sailors marched past on parade. He then went to the quayside and after a short speech boarded an Admirals launch and inspected the lines of warships dressed with full colours and His Majesty received a 21-gun salute. He sailed up and down neat rows of warships of all classes in an Admiral’s Launch and was heard to comment on the fine way Germany turned out her ships and crews and was also overheard to comment that he considered the German Navy as fine as that of his own. He had luncheon aboard the German flagship with the commanders of the Battle Sqaudrons based in Wilhelmshaven and members of the German Naval Staff. After lunch he inspected the Flagship and then resumed his voyage aound the base by launch before heading for the city hall to meet the Mayor for a State Banquet. His Majesty King Edward VIII has another day of rest at Herrenhausen and went hunting with several friends. His Majesty King Edward VIII today made a trip to picturesque town of Bad Godesberg where he had lunch with the Mayor and met some of the local townspeople. (A few veterans of the Great War were heard to boo and jeer the King but fortunately he was quickly guided away from them). Today His Majesty King Edward VIII visited the Rhine vineyards via a Rhine steamer and had a peaceful day with family and friends exploring the vineyards and making purchases for his private collection. His Majesty King Edward VIII returned to Berlin today for formal departure from Tempelhof airport via his personal aircraft flown by the King’s Flight. After waving to the assembled crowds and a brief photo opportunity his plane took off at 10:05am. Later in the day His Majesty landed in Bulgaria for the final leg of his European tour. An overnight train took him and his entourage to Tsar Boris’ hunting lodge, Tsarska Bistritsa, in the Rila Mountains just outside the resort of Borovets. His Majesty King Edward VIII today met with Tsar Boris at Tsarska Bistritsa where they discussed some political issues but it was also a happy family gathering. His Majesty King Edward VIII today spent time on a day of rest and hunting, a Royal Spokesman said this was a holiday of rest for the King. The Director of Mechanisation, Lt. Colonel G. Le Q. Martel, showed a team of high-ranking Army officers around the Nuffield works to observe the progress made on the Crusader cruiser tank production line. Now the factory is turning out the improved Crusader II with 51mm thick armour maximum with 10mm minimum and suspension and equipment improvements. Also seen was the first batch of twenty Crusader I AA Mk I anti-aircraft tanks awaiting delivery to a trials unit. The AA Mk I is the basic Crusader I chassis with the turret removed and single Ordnance QF 6pdr Mk VI semi-automatic AA gun fitted with an open-topped shield fitted instead. A short drive to Leyland’s factory revealed the initial drawings and a full-scale mock-up of a new cruiser tank, the Cruiser Tank Mk VII. This will have a bigger turret ring, new turret, thicker armour and the new Thornycroft RY14 500hp engine. His Majesty King Edward VIII after making a visit of the town Borovets and meeting local people boarded his aircraft to begin his long flight home via an BOAC airliner. His Majesty should land at Croydon airport tomorrow afternoon. Today the innovative Miles M.35 research aircraft made its first flight. The Miles M.35 has a high-mounted foreplane then a low-mounted swept wing (with unswept root section) with end fins and rudders and a pusher DH Gipsy Major engine. This ungainly but novel aircraft has been developed for tandem wing research for a compact carrier-based fighter and ordered under Specification E.8/39. The first short flight was made at low level but was terminated early. The RAF test pilot seconded from the RAE reported some measure of instability. Vickers has been given a development contract by the War Office for a new anti-tank weapon to be mounted in a new generation of tanks and also on new towed mounts. No specifications have been published but it is expected to be a 75mm class weapon capable of defeating 100+ mm of armour plating. The Vickers Wellington B.Mk.IV developed to replace the cancelled Vickers Warwick, today entered service use with the RAF. It is powered by two 1,615hp Bristol Hercules V radials and is almost identical to the Wellington B.Mk.III other than improved items of equipment and the lack of side guns. Structurally the Mk IV differs in being built from DTD646 light alloy to increase maximum loaded weights with minimal increase in empty weight and several aerodynamic, electrical and undercarriage refinements have been included. The British people went to the polls today to decide the next government of Great Britain. Overall the Conservatives retain their majority and can finally dispense with the Conservative-Liberal coalition but surprising gains by the Liberals over Labour gave them a credible force on the backbenches. The Labour Party achieved nearly 40% of the popular vote but only translated that into 168 seats, overall a gain of eleven seats. The Irish Nationalists remain in Parliament while none of the local Welsh or Scottish parties made any impact at all. The Marxist Party contested two seats and won one but they still play a very marginal role in British politics. Tonight Mr Chamberlain stood on the steps of No.10 Downing Street and thanked his loyal supporters for enabling him to win another electoral term. The Chain Home Low Type 2 (AMES Type 5) radio-location set has entered service with RAF units in British territory abroad. Today Prime Minister Chamberlain announced his Cabinet reshuffle. The last Liberal members have left, Sir Kingsley Wood becomes the new Chancellor of the Exchequer while two new ‘liberal conservatives’ Leo Amery and Harold Macmillan join the Cabinet and R.A. Butler has moved to Education. This is a cabinet of new and old and promises stability with some reforming zeal in social policies to keep in line with the electorates demands which have seen both Labour and Liberals gaining ground. Here is the latest data on British civil airlines, routes and equipment. Note some of the orders etc relate to 1941 data. Currently operates a fleet of; 24 Armstrong Whitworth A.W.27 Ensign (twelve 40-seat all passenger and twelve 24-passenger & mail aircraft), 5 Avro 685 York (all on order), 6 De Havilland D.H.86 Dragon Four, 14 De Havilland D.H.91 Albatross (six mailplanes and eight 22-seat airliners), 17 De Havilland D.H.95 Flamingo, 8 Douglas DC-3, 4 Handley Page H.P.54 Harrow, 2 Short Scylla, 1 Short Mayo, 21 Short S.23 Empire C Class, 3 Short S.26 G Class and 11 Short S.32 Sandringham (with 9 more on order). Currently operates a fleet of; 11 Airspeed AS.6 Envoy Series II/ III; 6 Avro 652D (another 18 on order), 10 Avro 685 York (all on order), 3 De Havilland D.H.84 Dragon, 6 DH.86 Dragon Four (all mailplanes), 29 De Havilland D.H.89 Dragon Rapide, 22 De Havilland D.H.95 Flamingo (plus 20 Flamingo Mk II on order), 3 Junkers Ju-52 (all mailplanes), 6 Lockheed Model 10 Electra, 14 Lockheed Model 14 Super Electra and 4 Lockheed Model 18 Lodestar (all on order). Operates flights to Taranto, Italy and Catania, Sicily and a longer daily route to Cairo via Alexandria as well as charter work. The fleet comprises two DH.84, three Percival Q.6 Petrel and one Douglas DC-2. Operates a single Short Scion on local charters and a weekly service to Muscat, Oman. Aberdeen-Wick-Kirkwall three times a week and Aberdeen-Wick-Kirkwall-Sumburgh daily (except Sundays) with two DH.89 Dagon Rapides. Formed by Sir Harry Oakes, Bart., in November 1936 with a Douglas Dolphin amphibian and a Luscombe seaplane for air club (The Nassau Flying Club) and charter use. A Grumman Widgeon is on order for delivery in late 1941. Operates Barbados-Trinidad four times a week, Barbados-Trinidad via Grenada, St Vincent and St. Lucia weekly return and a weekly ‘round Robin’ Barbados-Antigua-St.Christopher-Antigua-St.Christopher-Antigua-Barbados. It has two Lockheed Model 14 Super Electra and two Lockheed Model 10 Electra. In October 1937 received a three-year agreement with the government which agrees a subsidy and a set per-hour fee with a guaranteed minimum of 30 hours a year in return for first call on the airline’s services. It operates a passenger and mail service to the Mazaruni gold and diamond mines and the Rupununmi cattle fields. It has a single DH.89 (on loan). Has a fleet of two DH.84 Dragon, three De Havilland D.H.86 Dragon Four and one DH.89 Dragon Rapide and seven Percival Q.6 Petrel. Four DH.95 Flamingo Mk II are on order. Operates services to the Channel Islands from London, Southampton, Brighton, Exeter and Dinard, France. The fleet comprises four DH.89, two Airspeed AS.6 Envoy and two DH.95 Flamingo. In January 1935 Imperial Airways completed negotiations with the Air Ministry for the creation of a route from Khartoum in Anglo-Egyptian Sudan to Nigeria. It was intended for the flights to terminate in Lagos, but because there were no airports which were suitable for operations, the flights terminated in Kano, and passengers connected to Lagos by train. Imperial Airways required an airline to operate between Kano and the Elder Dempster Lines docks in at Lame in Togo. Imperial Airways (West Africa) Limited was jointly formed between Imperial and Elder Dempster on 7 November 1935, and it was operated as Elders Colonial Airways. Imperial Airways (now BOAC) owns a half stake in the company and supplies all aircraft and personnel. Imperial Airways loaned a DH.86 Dragon Four. A weekly service from Kano to Porto-Novo in Benin commenced on 25 June 1938 with an Armstrong Whitworth Atlanta. Once an airport was opened at Lagos flights were undertaken direct from Sudan and Elder Colonial Airways now operates daily Kano-Porto Novo and Kano-Lame routes with two DH.86 Dragon Four on loan from BOAC. Great Western & Southern Airlines Ltd., operates Land’s End to the Scilly Islands on weekdays with a single DH.89. Operates a route to Speke (Liverpool) three times daily (except Sundays) and a twice daily route to Belfast and a daily route to Dublin with six DH.89 and one DH.84. Operates a daily service in Kenya on the Mbeya-Dodoma-Nairobi route with an extension to Kisumu. There is a twice weekly route Nairobi-Kampala (Uganda) and a weekly service to Kigali (Rwanda) and twice-weekly route to Dar es Salaam. It has a fleet of five DH.89, three Junkers Ju-52 and one DH.90 Dragonfly. This Egyptian company operates an eleven-times weekly service to Lydda, Jerusalem (Palestine) and Beirut (Syria) from Cairo and also services to Cyprus via Lydda. This firm also operates all the internal Egyptian routes with five DH.89, four DH.84 one DH.90 and three Airspeed AS.5 Courier. The State-run airline of Palestine which operates services from Jerusalem to Amman, Jordan and shorter routes within Palestine. It has important Royal Mail and government transport contracts. It operates a fleet of two Fokker F.VII, two DH.84, five DH.89 and one DH.90 Dragonfly. Two DH.95 Flamingo Mk II are on order. Operates London-Liverpool-Isle of Man-Belfast daily, London-Glasgow daily, Liverpool-Belfast four times daily (except Sundays) and Glasgow-Liverpool three times daily (except Sundays). Has a fleet of four Airspeed AS.6 Envoy, 6 DH.86 Dragon Four, four DH.95 Flamingo airliners (with four Flamingo Mk II on order) and 14 Avro 652C. Another six Avro 652D are on order. Routes are Inverness to the Orkneys twice daily, Inverness to the Shetlands daily (except Sundays), Inverness to the Hebrides three times a week, Glasgow to Islay (via Campbeltown) twice daily (except Sundays) and Glasgow-Tiree-Benbecula-North Uist-Stornoway daily (except Sundays). Fleet comprises four DH.89 Dragon Rapide and five DH.84 and three DH.95 Flamingo airliners. One DH.95 Flamingo Mk II is on order. Some aircraft still carry Western Isles Airways Limited livery, but the firm is a wholly owned subsidiary. Operates Liverpool to Dublin twice daily and London-Dublin daily (except Sundays) with four DH.89 Dragon Rapide and one DH.86 Dragon Four. Six Avro 652D are in the process of delivery. Very interesting, and very thorough. I guess TCA has a monopoly on air travel in and out of Canada. I don't see any Canadian destinations in there, and only one Quantas connector for Oz. The BOAC routes are based on historical Imperial Airways and early post-war BOAC routes. There seems only to be one Qantas link although I suspect they would have thier own flying boat links to Singapore, Hong Kong, Arabia and Egypt. Likewise Canada would have its own trans-atlantic routes but until the northern route (Prestwick-Greenland-Halifax) route can be perfected with existing aircraft it remains a southern route. An extension from Baltimore to Canada could be arranged easily enough. Hopefully Brabazon and Princess will make the world a smaller place by the early 50s.